Kyle has a healthy set of lungs, which he put to good use mere moments after being removed from his growth chamber. He is doing very well, as is his extremely proud (not to mention entirely awesome) mother. As today is Friday the 13th, I thought there was really only one way to properly present my son to the world. Readiness Report: What’s in a name? Over the years, Laura and I have discussed the topic of baby names several times. Since early in our relationship, Laura had favored the names “Olivia” and “Luke.” However, a few years ago it seemed that everyone was naming their baby girl “Olivia,” and the name lost some of its appeal to us. 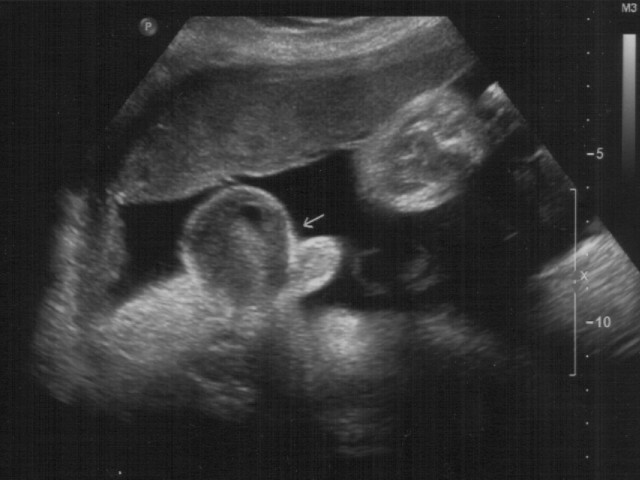 Shortly after we found out Laura was pregnant, I asked her if she was still considering “Luke” as a boy’s name. Truth be told, that name had also lost its appeal for me. I was relieved when Laura replied that it was no longer a contender. We then had a couple of long conversations about new alternatives for naming the baby. As is fairly common, we agreed that the name (or, at the very least, part of it) should have some ethnic/cultural significance to both the Johnson and Sperry families. Laura’s mother is Colombian, and her paternal grandmother’s family is Scandinavian. Most of my ancestors hailed from Finland. Unfortunately, our combined family trees did not yield any one name with which we could honor both clans. Simply glancing at the range of family surnames (Garzon, Peña, Sperry, Carlson, and Johnson, Komula, Niemi, Mikkola) reveals that there’s not bound to be a lot of common ground. Thus, the task before us was daunting. Learning that the baby is a boy should have simplified matters, but we still had no real starting point. Yet it remained of primary importance to us both that we instill our son with a sense of his varied lineage. Whatever we chose, Laura decided early on that we wouldn’t tell anyone until after the baby was born. She didn’t want our selection to be criticized or second-guessed by friends and family, as often occurs. By keeping the name a secret, Laura hoped to eliminate any opportunity for debate until it was too late – once the child is born and officially named by his parents, who would dare quibble with us? The logic sounded reasonable, at first, but it turns out that there are a lot of people who really want to know what our son’s name will be. They have tried, through straightforward questioning and downright trickery to get us to reveal the name. “I want to monogram his gift,” they said. Or a simple, “so, what’s the baby’s name?” interjected into an entirely unrelated conversation. It was as though our friends and family had turned into starving dogs, and Laura and I had the last soup bone left on the planet. Well, in these final days, our collective resolve has weakened. We’ve decided that there is no harm in revealing the name now, but no one — be they blood or not — will convince us to change the name we so painstakingly selected. The time between four home pregnancy tests returning positive results and the ultrasound was filled with baby conversations. At first, Laura wasn’t absolutely convinced that there was a person growing inside her, but that didn’t stop us from talking about it. 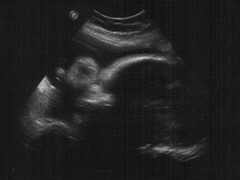 A day or two before the ultrasound, we were having dinner at The San Francisco Oven and we returned to the subject of names. We both threw out a few suggestions, but nothing stuck. The difficulty of finding the perfect combination of first and middle names that would resonate with our respective families was proving all but impossible to overcome. We mulled over middle names starting with our fathers and my mother (Laura’s mother has no middle name), then going back to grandparents, great-grandparents, and so on. Laura has spent significant time researching her genealogy over the last few years, so she had a lot of names to choose from, whereas my knowledge of my own family tree only goes back a few generations. After a good deal of discussion and a fair amount of frustration, we started over with yet another interesting strategy. We’d heard of some couples combining their first names to form an entirely unique name — an acquaintance named “Jonobie” (whose name is a combination of “Jon” and “Obie,” both of which I’m probably spelling incorrectly [EDIT: See comments for correct spelling.]) comes to mind. Also, Laura had a friend in grade school named “Rhonda” whose parents were Ron and Linda. Alas, “Laura” and “Kris” don’t easily combine to form anything. Once again, we traversed our family trees to see if some combination would create something that we liked. Unfortunately, nothing was working. “Zorandra” and “Wilhold” (i.e., Zoraida/Sandra, Wilhart/Harold) and the dozen or so other namemorphs we came up with sounded like monikers from a bad science fiction movie or, even worse, a Dungeons & Dragons gaming manual. We realized with great frustration that naming our firstborn would require us to stretch the limits, consider a new paradigm, perhaps even think outside the box. Eventually, we posed this key question: aside from ethnic heritage, what is an important cultural influence common to both families from which we could draw much-needed inspiration? And for the answer we needed to look no further than the two women who had given each of us life. In the end, it was our own mothers’ true musical passion that finally provided us with the perfect name combination for our son. An uncommon name? Yes. Unusual? Certainly. But — without doubt — we have chosen a name worthy and befitting the shared grandson of Sandra Johnson and Zoraida Sperry. We look forward to welcoming you, Diamond Neil Johnson. Though my young apprentice is not yet entirely ready to emerge from his growth chamber, the time draws nigh. As is appropriate, certain preparations have begun. The room in which the young one will be housed has been made ready. A border — upon which is imprinted a pattern of stars, moons and suns to symbolize the entirety of the galaxy he will one day rule — has been applied to the walls, along with other, similarly-themed accoutrements. Likewise, the crib in which he will rest and dream of future glory has been assembled and appointed with such regalia as befits his station. The bassinet in which he will sleep during his early infancy has also been assembled and adorned with appropriately elegant and majestic trappings. I can take no credit for this. Tomorrow morning I will journey to the Willoughby Fire Department and consult with a “child safety seat expert” to ensure that the car seat is properly installed in the MVoD. A yellow folder has been readied; within are hospital admission documents. Also at the ready is a small overnight bag, prepared by Laura. I am creating a playlist on KJToonz entitled “Push ’em out, shove ’em out, waaaaaay out!” comprised of music that Laura finds soothing and relaxing. He is coming. It is only a matter of time.